Ten lanes of freeway come into view from this vantage point above Interstate 40 at Spence Lane in Nashville. Photo taken April 4, 2013. Interstate 40 stretches across the width of Tennessee, entering across the Mississippi River at Memphis and departing across the Great Smoky Mountains east of Hartford. The 455 miles of I-40 in the Volunteer State are more than any other state it traverses. Crossing the Mississippi River, the Hernando de Soto Bridge consists of a through arch bridge with six overall lanes and no shoulders. The span was completed in October 1973 and seismically retrofitted in 2006.1 Heading east from the bridge, I-40 passes north of Downtown Memphis to Interstate 240. The freeway turns north there to use the northern third of the Memphis beltway to Sam Cooper Boulevard. 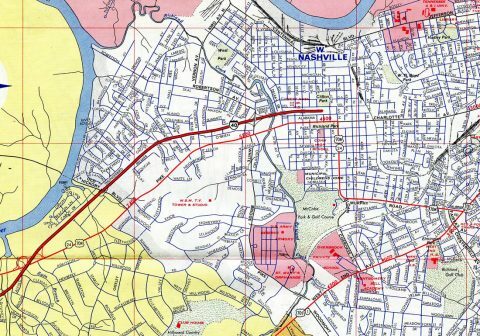 This was not the original plan, as 1956 federal highway legislation mapped out a route across the city through Overton Park. Approved by the federal highway administrator in 1966, $2 million in right-of-way was acquired in 1969 from the city of Memphis, which owned the park. The project was to move forward in November 1969, but mounting opposition, including efforts from the Citizens to Preserve Overton Park group, halted work. A lawsuit was subsequently filed, and on March 2, 1971, the U.S. Supreme Court resulted in favor of the citizens group.1 I-40 east of the park was however constructed. It remains in use today as the locally maintained Sam Cooper Boulevard, though some signs along the route allude to its past as the planned route to Little Rock, Arkansas. Originally Interstate 40 was slated to run east from Midtown Memphis through Overton Park to Sam Cooper Boulevard. Opposition to that plan ultimately canceled it and the freeway mainline shifted to the northern beltway, eventually replacing Interstate 240 between Exits 1 and 12. The cancellation of Interstate 40 resulted in the shifting of the route north onto an overlap with I-240. The 240 aspect of the overlap was eventually dropped in 1982. Work at the eastern junction between the two routes was upgraded initially between 2003 and 2006, and again from 2013 to 2015 to incorporate high speed flyovers for the I-40 mainline movements. Seven interchanges serve the city of Jackson. East from the Madison County seat, I-40 traverses increasingly hilly terrain to Nashville-Davidson County. Interstate 840 provides a long distance bypass of the capital city between Exits 176 and 235 while I-40 crosses the metropolitan area to Downtown. Overlaps within Nashville add traffic from I-65 and I-24 as I-440 encircles areas to the south as an urban loop. The $62-million Fast Fix 8 project3 involved the replacement of the 1968-built bridges carrying Herman Street, Clinton Street, Jo Johnston Avenue and Charlotte Avenue in Downtown Nashville. This work involved shutdowns of the entire freeway during ten weekends between July and November 2015. The accelerated project was completed well ahead of schedule on December 4, 2015. 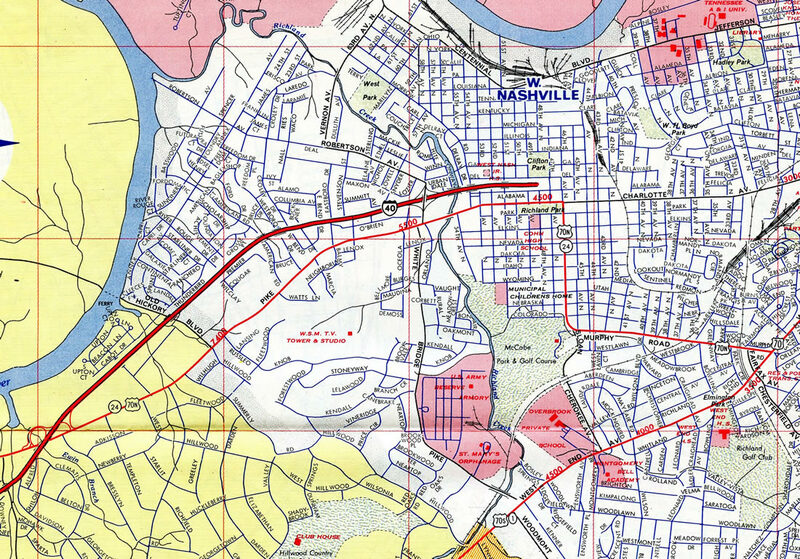 The portion of Interstate 40 between West Nashville and the split with I-24 & 65 southeast of Downtown was incomplete in 1969. Motorists were detoured along a combination of U.S. 70N and U.S. 70 across the city. Note that U.S. 70N was eventually renumbered as part of U.S. 70 to Lebanon by 1970. Interstate 40 serves central Nashville, joining sections of Interstate 65 west of Downtown and Interstate 24 southeast of Downtown. Interstate 440 provides a bypass to the south. Interstate 40 progresses east from Lebanon along a winding route across increasingly hilly terrain to Cookeville and Monterey. A new interchange is under construction in Cookeville at Lick Creek Road with the State Route Connector joining I-40 with U.S. 70N (SR 24)4. A contract for work on the project was let on December 4, 2015. Shifting southward, the freeway crosses the Cumberland Plateau to Crossville and Rockwood. A series of ridges rise to the west of Knoxville, affording drivers with a scenic drive to the merge with I-75 near Farragut. 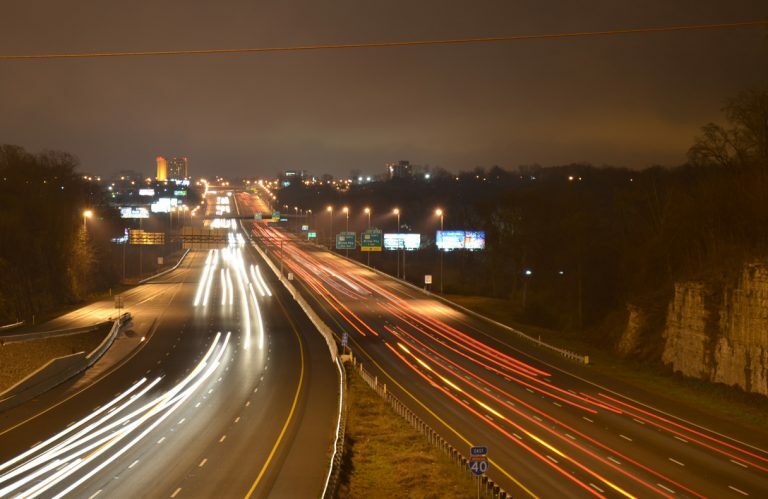 Heavy traffic ensues as Interstates 40 & 75 expand to eight lanes to the city of Knoxville. I-140 spurs east from the overlap to Alcoa and Maryville while I-640 provides a bypass of Downtown Knoxville further east. Heavier truck traffic accompanies the remainder of the route east to Dandridge and Interstate 81. A major reconstruction project was completed in 2009 along the Interstate 40 corridor near Downtown Knoxville. Named SmartFix40, work included tearing down and rebuilding the Interstate 40 viaduct at Interstate 275 and expanding the existing freeway from there eastward to Cherry Street. Included in the project was the September 2007-completed redesign of James White Parkway (SR 158) and parallel Hall of Fame Drive with an extension of that road to a redesigned 5th Avenue interchange. Upon completion, I-40 was expanded to six overall lanes along the stretch. Interstates 40 and 75 overlap for 17 miles leading east to Interstate 640 in Knoxville. Prior to 1980, I-75 formed an L-shaped route to Downtown Knoxville along side I-40 to what is now I-275 north. Construction between February 14, 2014 and June 29, 2016 at Exit 407 with Tennessee 66 (Winfield Dunn Parkway) converted the parclo interchange there into a diverging diamond interchange (DDI).5 The updated exit better serves adjacent retail and Smokies Stadium, a Minor League baseball park. East into Jefferson County, Interstate 81 splits with I-40 northeast to the Tri-Cities and southwest Virginia while I-40 curves southward across Douglas Lake to Newport. The remainder of the route traverses the Appalachian Mountains through Pigeon River Gorge. This route involves numerous turns and is subject to potential rock slides during inclement weather. I-40 exits the state by Snowbird Mountain.